Slugs are shell-less members of the molluscan class Gastropoda. Related to snails, but different due to their lack of shell, slugs can cause the same amount of damage in a garden as snails do. The great majority of slug species are relatively harmless to humans, but some are considered to be great pests in agriculture and horticulture. This is because they feed on plants, as well as fruits and vegetables. Not only that, but they cause holes in the crops, making the items unsuitable to sell due to aesthetic reasons, as well as causing them to be much more vulnerable to rot and numerous other diseases. There’s a great variety of vegetables and herbs they can feed on, including flowers such as petunias, chrysanthemums, daisies, lobelia, lilies, daffodils, narcissus, gentians, primroses, tuberous begonias, hollyhocks, irises, and fruits such as strawberries. They also feed on carrots, peas, apples, and cabbage that are offered as a sole food source. 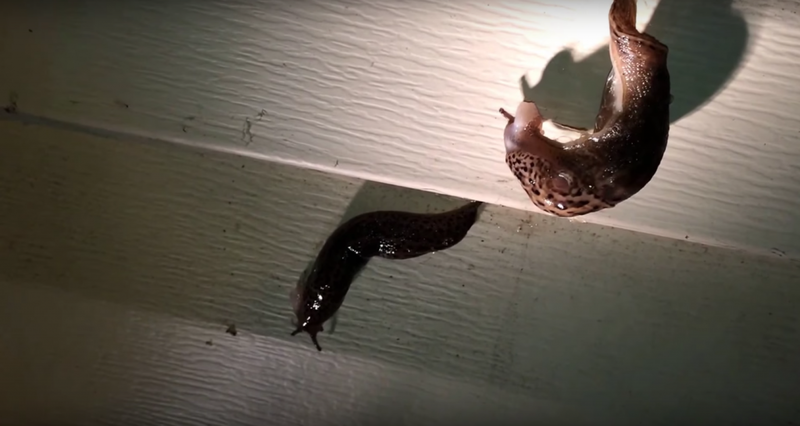 When noticing slugs in your garden, you need to quickly take action against them. Avoid having them take control and decimate your crops, as they will not hesitate in eating everything they can. The first step in making sure they do not have the proper habitat to develop, is to clean up your garden. Slugs love dark, humid places and they can usually be found hiding under piles of leaves or wood, under boards, nursery pots or weeds areas and low hanging leaves at the basis of plants. By cleaning up the area and eliminating any possible hiding places, you will manage to block the quick development of slugs. Make sure to trim off leaves that reach the ground, put any container you need in a garden a few feet up off the ground, so that they cannot shelter underneath it, keep compost piles away from the garden and make sure the ground is levelled and not too shady. After making sure you’ve landscaped your garden and it is now a place where slugs do not feel quite as home as they used too, you can take the next step and go after them, on a gathering mission. Early in the morning, on late evenings and after a rainy period are the best times to remove the effectively. That is when they surface in search for food, so finding them is not that difficult. If you are dealing with a dry weather, you can water your garden and go hunting a few hours after that, as this will help bring them out from their hiding spots. The handpicking of slugs can be easily done with a small or medium sized population. Depending on the extent of your crop, this method can prove to be difficult, but if you just have a small garden and a few of the crops have been affected, it is best to take care of the issue quickly, before the slugs get to other crops as well. Make sure you also check the underside of the leaves and follow any slime trails you see. To make it easier to collect the slugs, you can set some traps using some of the foods they like. Both snails and slugs love citrus fruits, piles of oatmeal, dry dog food or even cabbage. Placing these under a board will make the perfect gathering space for slugs. Boards can also be used and placed with one side on a stone and the other on the ground. The darkness and humidity that forms there will attract the slugs and trick them towards a safe spot to hide. Remember to always wear gloves when collecting slugs from such places, and put them in a bucket with soapy water. This will kill them and you can then dispose of the mollusks. Placing bowls of beer is also a good trap for both snails and slugs, and they are quite strong, and these critters love the smell of beer. Falling into the bowl makes them drown and you can then dispose of the contents, refill the bowl, and wait for another round to get caught. You can bury steep cups near important plants, so that slugs get distracted when aiming for the plant and go towards the beer cup instead. By replacing these traps every few days, you should be able to steadily clean up your garden. To protect your traps, make sure you cover them with an upside-down flower pot that has a small entrance. This will keep your pet from eating the bait themselves, or rain from washing away your bait. Irrigation of the garden is also important, as it can influence the development of the slug population. As mentioned above, watering the garden does bring the slugs out, so watering it in the morning to give it time to dry before slugs come out at night is the best move. Studies have shown that watering in the morning instead of the evening can reduce the slug population with 80%. You can also install drip irrigation systems, to minimise the use of water. Planting everything with enough space between them is also important, as it allows air flow and prevents the development of mulch as well. Make sure you keep your garden free of debris and mow your yard regularly as well, as it will help with the drying of the soil by nightfall. When it comes to creating barriers around your plants, the best materials for these are copper, salt, wormwood tea, oak leaf or tobacco mulch. These last two can be prepared and either spread as a barrier around plants, or combined with soapy water and sprayed onto the soil or directly onto slugs. Copper barriers can be placed around the plants or planting beds, but they have to be wide enough that the slug cannot bridge it with its body. Salt is not the best solution, as it can affect the soil and plants as well. It is better to be used around the base of potted plants, or other areas where it cannot come in direct contact with the plants as well. Using it in the garden can be tricky as rain water can easily wash it off into the soil, harming its quality. Natural barriers can be grown, with the help of plants that deter slugs on their own. Certain plants have a texture, taste or even a certain amount of toxins that slugs avoid. Planting them as barrier around your whole garden, or just some of them near the affected pants, can help you get rid of the pests you are fighting with. Some types of herbs, vegetables and even flowers can do the trick, and the best known for keeping slugs at bay are ginger, garlic, chives, mint, and chicory, kale, spring cabbage, or sprouting broccoli, Astilbe, Dicentra, Digitalis (foxglove), Lobelia, Viola (some pansies and violets), Campanula, Hemerocallis and Mentha. Plants can also be protected with more powerful barriers, such as those created out of wood ash or Diatomaceous earth. While wood ash can raise the pH of the soil, Diatomaceous earth can also affect beneficial insects. Its sharp edges scrape through the slug’s protective mucus layer and skin, causing it discomfort. It does not cause the death of the slugs, as it does with insects whose exoskeleton gets pierced, and they end up dying from dehydration, but it does cause a high level of discomfort, and you will see slugs turning away from the place where they have encountered this powder. To protect a plant from slugs, dust its leaves with diatomaceous earth or sprinkle the material over the ground around vulnerable plants in a protective circle. Moisture renders this material ineffective, so reapply it after each rainfall, or every few days if conditions are humid, to achieve continuous control. A lot of other organic deterrents can be used, such as powdered ginger, talcum powder. A coarse mulch of something like oak or cedar bark chippings makes a decorative and effective slug barrier. Organic mulches, while beneficial to the soil, harbour slugs with food and moist shelter. A mulch of pine needles however, makes a prickly barrier to keep slugs away from your plants. A barrier of ash and cinders helps keep slugs at bay. The cinders are rough to cross, and the powdery ash also acts as a desiccant. Wood ash and cinders are preferable. Avoid their direct contact with plants. You can also create a sawdust barrier around vulnerable plants. If possible, use sawdust from hardwood because it’s sharper and more abrasive. By encouraging the development of natural predators around your garden, you can also get rid of slugs. Such predators include shrews, mice, squirrels, and other small mammals such as salamanders, toads and turtles. You can also use the help of several types of birds against these pests, whether keeping chickens or ducks, if you have a yard, or encouraging other birds to visit your area, such as thrushes, grouse, blackbirds, and wild turkey. You can also use nematodes, which are microscopic parasitic worms that live in soil. They can be purchased specifically for killing slugs, and they can be very effective. Once all the slugs are killed, the nematodes will leave the area or die out. However, they need to be reapplied every few weeks or the slugs will reappear and take over again. Please confirm your region, in order to load the content relevant to you. This way you will avoid seeing solutions that are not available in your country. If you are not pleased with the results of these organic deterring methods, you can also choose to apply chemical baits. Most chemicals used against slugs are based on metaldehyde. These products are toxic and can be dangerous for pets (dogs, cats, fish) especially because they resemble their granular food, which is why we recommend using the finest granular chemical baits when pets can be found in the area where the product is applied. The metaldehyde from the chemical products can rapidly dry the slug (it may lose half of its weight and its size can be reduced to one-third) in the case in which it gets poisoned by this substance. But if the degree of poisoning is not so high, slugs infected can recover if they manage to hide in moist soil or if it rains, as their body will get cleansed by this. Another drawback is that after being dampened, metaldehyde products no longer work, so that means every time you water your garden, or it rains, you will need to re-apply it. Many chemical based baits work, but following the instructions on how to use them is mandatory and one must be extremely vigilant in how and where they are applied, as side effects must be avoided. Slug baits with metaldehyde are sufficiently toxic that they are not recommended for use around edible vegetables, and can be harmful to dogs, cats, and fish, as mentioned above. Solutions made out of water and ammonia can also be sprayed onto slugs whenever present. One part ammonia and six parts water is the necessary combination, but be careful not to spray it directly onto plants, as it can damage the leaves. Iron phosphate baits can also be used, as they are toxic specifically to snails and slugs. They can stay intact for weeks if you protect them from rain, and they cause slugs to stop eating and eventually die. You can safely use iron phosphate around food crops, ornamentals, lawns, gardens, greenhouses, and berry gardens, as they are safe to use around pets, humans, fish, birds, beneficial insects, and mammals. This type of bait is more effective than metaldehyde-based products, as it does not cease to have effect once it rains on it, however keeping it dry makes the baits last longer. Iron phosphate remains active longer, so less is required to be used to kill more slugs, making this product quite cost-effective. 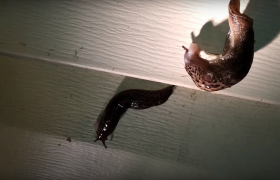 When it comes to getting rid of slugs, timing is everything. No matter what method you choose, it is best to apply it early in the year, before they manage to lay their eggs. By doing this, you get rid of this generation and future generations as well. Long-term control is best done in autumn, when the weather is quite damp. This way, when spring comes, there will be fewer adults ready to lay eggs, so you will not have a big population to fight against. After getting rid of an infestation of any size, you will need to apply preventive measures as well, to make sure the slugs do not have the possibility to take over your garden again. Change the way you take care of your yard and vegetation. Till the soil in your garden frequently, especially around your plants and flower beds. This will kill any slug eggs and can help reduce their future population. Clear the debris under your plants, so slugs cannot hide underneath them and apply any other preventive measures that can be found in our article ‘Prevent infestation with slugs‘. These will help keep your garden clear of such pests, as prevention is the most important step in getting rid of any pest you might be dealing with. You can find more information in our article regarding ways to prevent infestations with slugs. In order to prevent slugs from entering your house, you can use the same repellent methods meant to protect your garden, or you can even place a trap near the entrances of your house, as it will also help in monitoring the level of infestation. You can empty the trap every 2-3 days if necessary, and reuse it, which make it a very economic measure. Weasels are mammals of the genus Mustela, family Mustelidae, which is often aptly referred to as the “weasel family”. They are small, but active predators that have been known to eat eggs, poultry, and rabbits from farms. From this point of view, one can understand why they are sometimes considered to be pests. The wild pig, also known as the wild boar, the wild swine, or, scientifically, as Sus scrofa, is a large mammal, belonging to the family Suidae. The relationship between wild pigs and humans is long-standing, considering the fact that the wild pig is the ancestor of most domestic pig breeds. Squirrels are medium-sized rodents that belong to the family Sciuridae. Although they do not infest homes in large numbers and are considered by many to be cute, squirrels are also found to be much more invasive than any other type of pests, mainly because of the range of damage they can cause. Part of the Mephitidae family, and are mammals known for their ability to spray a liquid with a strong, unpleasant smell, in order to defend themselves from predators. As they are not pretentious eaters, and can thrive on human waste, they can often take residence near your yard or under your decks. Present in many neighbourhoods, skunks are not necessarily a problem. Being a marsupial animal found only in the Americas, the opossum has become a pest in those areas, due to its flexible diet and reproductive habits that make them successful colonisers and survivors in diverse locations and conditions. They are considered a nuisance due to the fact that they feed on plants, carry disease and are prone on destroying property. A nice garden and lawn takes a lot of work, time and money, and all that work can be undone by moles in no time. They can destroy a nice garden with their tunnels and molehills, affecting crops as well, not just the landscape that you have created. Moles can dig lots of tunnels which have large rooms for food storage, and this can affect the roots of plants or make the soil unstable.